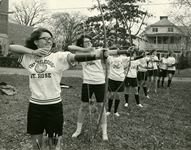 Where on the Web is the Saint Rose Archives? Saint Rose on Pinterest - "Vintage Saint Rose"
All Over Albany - "Riding the Trolley"
Want to learn more about Saint Rose's History? 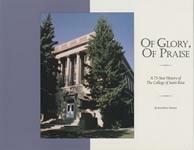 Browse RoseMarie Manory's book, Of Glory Of Praise. It is available online through the Archives Digital Collections and in hardcopy at the Neil Hellman Library. No time for a good book? Check out our online publications! We have digitized our student literary publications from 1921 through 1935. Before the student newspaper began, students were hard at work creating a publication to both inform and entertain their fellow students. The first student publication began in 1920 and was called "Canary Trills." The name changed to "Rambler" in 1928. Rambler continued well after the student newspaper started in 1936. Other publications have come and gone and students continue to publish literary and creative publications today. Our college has a rich history and heritage. To learn more about the symbols of the school - such as our alma mater, school colors, and motto - check out the online exhibit, Symbols of the College. 2020: Our First One Hundred Years! The College will be 100 years old in 2020. While looking forward to our centennial, we are also looking back at our history and heritage. Each year, starting in 2010, we are celebrating a decade of progress. The college experienced much change in the 1960s, as did the country. Many traditions, including Rose Day, were discontinued. The Student Senate became the governing body for students. Some programs ended, while new programs emerged, notably in communication sciences and disorders. Students were active politically and in the community. The greatest change came with the admittance of the first undergraduate male students in 1969.